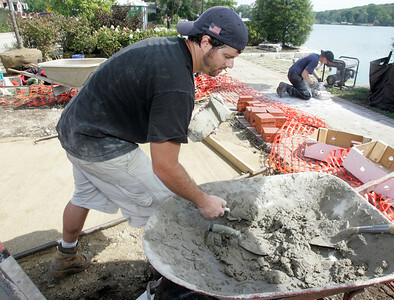 Work continues on The Algonquin-Lake in the Hills Firefighters Association memorial at Algonquin’s Riverfront Park. 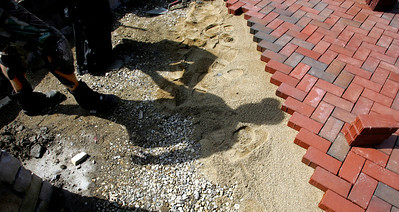 H. Rick Bamman -hbamman@shawmedia.com Former Algonquin firefighter Dan Killian of Algonquin casts his shadow during work Wednesday at the site of the firefighter memorial at Algonquin’s Riverfront Park. The memorial will pay homage to those who died during the Sept. 11, 2001, attacks and two firefighters who died in the line of duty for the Algonquin-Lake in the Hills Fire Protection District. Money for the $30,000 memorial came from fundraisers held by the firefighters association. 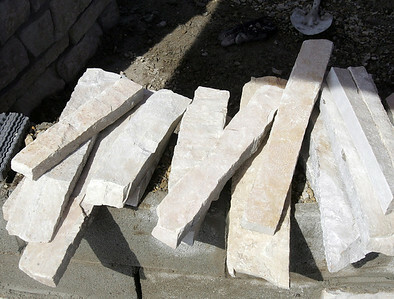 H. Rick Bamman -hbamman@shawmedia.com Limestone veneer pieces ready for placement on the memorial wall. H. Rick Bamman -hbamman@shawmedia.com Firefighters Brad Avi (CQ) (left) of Huntley and Justin Dusek of Crystal Lake volunteer Wednesday to build the Algonquin Firefighter memorial at Algonquin’s Riverfront Park. A 5400 pound I beam piece from the World Trade Center will be instaled at the memorial. The Algonquin-Lake in the Hills firefighters association plans to dedicate the memorial Sept. 11. H. Rick Bamman -hbamman@shawmedia.com Nilco Landscaping's Brent Johnson and firefighter Matt Berg (far left) dis cust the progress of the project. 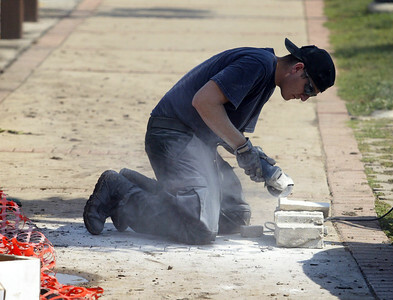 Firefighters Dan Killian, Brad Avi and Justin Dusek swap out a piece of limestone veneer for a better fit during work Wednesday. H. Rick Bamman -hbamman@shawmedia.com Alognquin - Lake in the Hills firefighter Justin Dusek of Crystal Lake cuts a corner piece of limestone veneer on Wednesday at the site. The Algonquin-Lake in the Hills Firefighters Association plans to honor fallen firefighters with a memorial at Algonquin’s Riverfront Park. It will pay homage to those who died during the Sept. 11, 2001, attacks and two firefighters who died in the line of duty for the Algonquin-Lake in the Hills Fire Protection District. Money for the $30,000 memorial came from fundraisers held by the firefighters association. H. Rick Bamman -hbamman@shawmedia.com Former Algonquin firefighter Dan Killian of Algonquin levels limestone veneer for one of the wallsof the memorial at Algonquin’s Riverfront Park. It will pay homage to those who died during the Sept. 11, 2001, attacks and two firefighters who died in the line of duty for the Algonquin-Lake in the Hills Fire Protection District. Money for the $30,000 memorial came from fundraisers held by the firefighters association. H. Rick Bamman -hbamman@shawmedia.com Firefighter Kevin Goers uses a backhoe Wednesday to help install landscaping at the memorial. The memorial will feature a plaque honoring those who died in the Sept. 11 attacks on the World Trade Center, the Pentagon and United Flight 93. The memorial also will honor firefighters Edwin LeRoy Benson and Capt. G.D. “Mac” McIntyre, who died in the line of duty for the fire district. 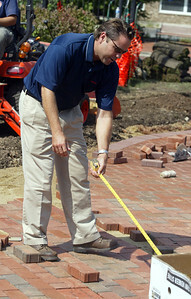 H. Rick Bamman -hbamman@shawmedia.com Nilco Landscaping's Brent Johnson mesures the brick walkway. 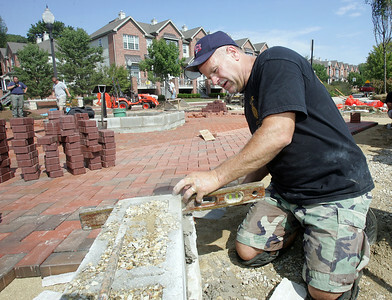 Former Algonquin firefighter Dan Killian of Algonquin levels limestone veneer for one of the wallsof the memorial at Algonquin’s Riverfront Park. It will pay homage to those who died during the Sept. 11, 2001, attacks and two firefighters who died in the line of duty for the Algonquin-Lake in the Hills Fire Protection District. Money for the $30,000 memorial came from fundraisers held by the firefighters association.